This Noren, divider fabric, is hand-dyed by this 74-year-old Craftsman at his studio in Kyoto. 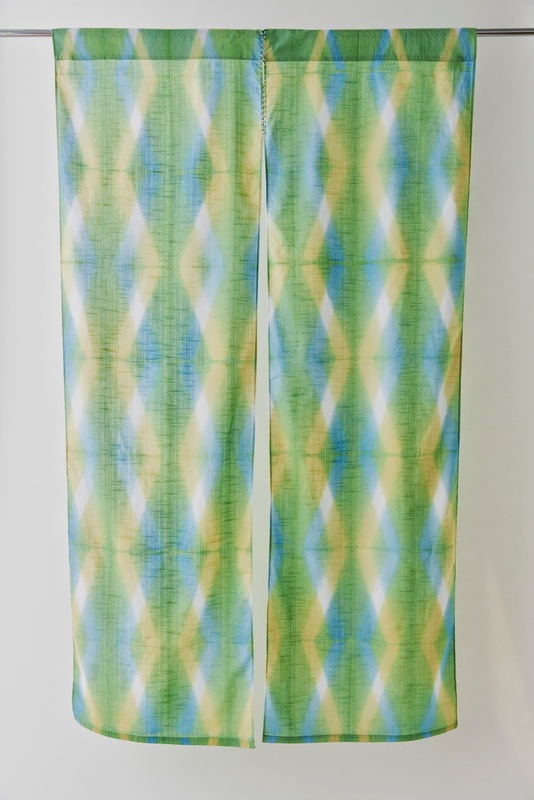 The method called Ita-Jime is one of the shibori (tie-dye) technique and uses wood to bind the cloth to resist dyeing and make patterns and different colours. Here is how it is made. First the cloth is soaked in the colored hot water to make the base color. Once the cloth is dyed, the color won't come off even if you wash. It was blue color in the water but it turned into purple once the the cloth had contact with air! Can you see slight purple in the cloth?? The cloth is dyed in two different buckets to deepen the color. Yes, each piece of cloth is dyed by his hands. His color palette. The color can change depending on the temperature and humidity on the day. He adjusts the amount of the pigment each time by his long-year experience. This is just a part of whole process. Keep your eyes open for the next post! You can see his completed work here!